OEX California's web arm, Kayak Fishing Supplies, Inc, has been offering fishing kayaks and accesseries for sale on line since 2008. OEX has been in kayak fishing business since 1995. 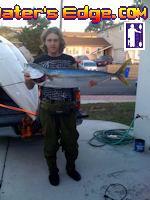 Provide quality products at competitive prices that we know to be useful and beneficial to kayak fishermen. Kayak Fishing Supplies offers a unique service for online shoppers. Since it is an established, full service kayak fishing shop, KFS offers complete installation services before your kayak leaves our hands. And the best part? It's Free! When purchasing a kayak from KFS, just select the accessories you'd like installed, include any special instructions in the "Notes" section up on checkout, and they will be installed free of charge. Hatches, rodholders, fishfinders, bait tanks, rudders, we do it all! Why buy from KFS? Consider the following. Please visit Customer Testimonials Page. San Diego's kayak fishing headquarters. This store is a full service kayak fishing shop with bait tanks, electronics, kayak gear, clothing and offers Malibu Kayaks, Jackson Kayaks,Wilderness Systems, Ocean Kayak, and Native Watercraft. We do repairs and installations at this location and offer a monthly kayak fishing class. We are right on the water and you can try before you buy- we have Demo models of all the models we sell. Right on the water in Huntington Harbor, this location offers rentals, repairs, installation and a large selection of accessories for fishing and kayaking. Our store in Sunset Beach is our Hobie Kayaks authorized dealer. Please note that all Hobie Products are only stocked in and shipped from our Sunset Beach store. If you selected "Store pick-up" during the checkout and your order contains Hobie products, you can only pick it up form our Sunset Beach store.